Search engine optimization (SEO) is tough. But for restaurants, improving your search engine ranking can have a huge impact on the traffic your website receives. The top result from a Google search receives a third of all clicks, and the drop-off is steep after that. What does this mean? It means if you’re not right near the top for the most relevant search phrases for your restaurant, you’ll only receive a tiny fraction of the traffic you could be getting. It’s not easy to rank your site for competitive terms. If you’ve got local competitors that are out-performing you on Google in a big way, you should look into a digital marketing company that understands SEO and can help you improve your on-site and off-site factors. But in some marketplaces you might be able to capture a great spot with only a few small changes. In this article, I’ll show you three quick steps that most restaurants, cafes and bars can take to improve their ranking. 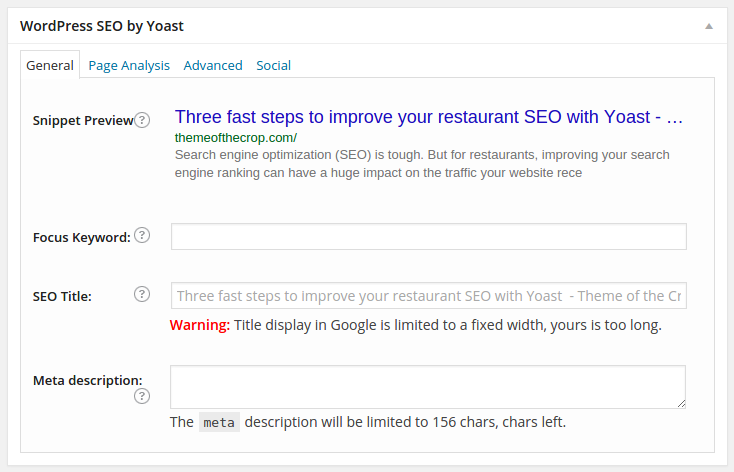 We’ll be using the (free) Yoast SEO plugin. This plugin is a recommended install with all of my restaurant WordPress themes, and you’ll need it activated on your site to follow along. The title of each page on your site should be unique and should include vital information that will help Google return your result. Yoast provides a helpful pattern system so that you can define how each page’s title will be constructed. If you’re in Springville, Illinois, your local customers will be searching for “wine tasting in Springville, Illinois”. Let’s add your city and state to the title, so that it’s included with each of your post titles. 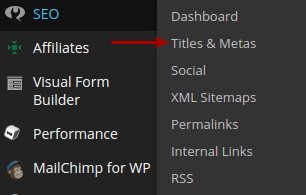 To do this, go to the SEO page in your WordPress admin dashboard. You might want to repeat this step for other custom post types, depending on your site. But doing this with Pages and Posts should help. Now you’ve set the default title for posts and pages. But you can also override this for each individual post and page. This is great if you’ve done a lot of keyword research. But if you’re just looking for an easy kick, try editing the title for your site’s homepage. Open the page for editing in your WordPress admin area. Scroll down below the main content block and you’ll see a panel called WordPress SEO by Yoast. There’s a lot you can do with this panel, and I strongly encourage you to read Yoast’s SEO Guide for WordPress. But for now we’ll just focus on crafting a better title. In the Snippet Preview section, you’ll see the title of the current page or post. You can overwrite this in the SEO Title field below. We’ll use that field to craft a great homepage title. See the pattern? Focus on a phrase that your customers will search for, then hammer that home with your personal brand and character. If you have a marketing professional helping you out, listen to their advice. They’ll do keyword research to find the most valuable phrases for your business. This last one is the hardest part. If you’re doing your online marketing well, you’ll be posting content regularly. This might be about upcoming events, goings-on in your community, changes to your menu or special prizes or giveaways for customer loyalty. Just like we edited the page title for your homepage, we can edit the titles for any of your pages or posts. Let’s say you’re a bar and you’re having an event to celebrate the local home brew culture. Maybe you wrote up a post about this, called it “Home Brew Event”, and put it up on your site. You might think that, because it’s a one-off event, it’s not worth putting time into the article. But that single article might continue to bring traffic to your site for years if it ranks well on Google. Maybe there’s a lot of people wondering about the local home brew culture. They might also be your customers some day. Now we’ve tailored the title of the page to your local market, so people searching for home brew in Kansas City have a better chance of seeing your post. Unfortunately, no. SEO is really very difficult, and none of the advice offered here is going to bring you to the top of Google rankings in a competitive market. If it were that easy, everyone would be there. But with this advice you can avoid some common mistakes, and ensure that the titles in key places on your site are not working against you. If you want to take this further, I’d point you to the Yoast SEO guide again. You may also want to hire someone experienced with keyword research. They can help you target the right keywords — the ones that your potential customers are using.